We could build a sustainable future. Oil is running out. Coal is dirty. And fracking, the process used to extract natural gas, contaminates ground water. And using any of these fossil fuels adds to the atmospheric carbon dioxide that’s warming our planet. But as this year’s historic hurricane season has shown, the world has plenty of wind. In fact, new research by scientists at the Carnegie Institution for Science in Stanford, California suggests that one stupendous wind farm floating in the North Atlantic could capture enough energy to power the entire world. “If commercial-scale deep water wind farms became technically and economically feasible, they could potentially provide civilization-scale power,” the researchers said in a paper published recently in the journal Proceedings of the National Academy of Sciences. Climate scientists have long known that wind speeds over the ocean average 70 percent higher than those over land. Stronger winds translate into greater power generation. The challenge facing engineers is that when turbines spin in the wind, they slow it. The resulting wind “shadow” renders nearby turbines less efficient. Place turbines too close together, and a wind farm’s energy-generating capacity can plummet by a factor of 10. The Carnegie scientists, Anna Possner and Ken Caldeira, suspected that drag like this might be far lower over water than over land, particularly in mid-latitude oceans in both the Northern and Southern hemispheres. Why might that be? As Earth tilts away from the sun each autumn, jet stream-like rivers of air form high in the atmosphere. Over the open ocean, storms pull these strong winds down near the planet’s surface, replenishing the wind energy captured by turbines. The effect might sound small, but it adds up. The scientists calculate that a wind farm in the middle of the North Atlantic would generate at least twice as much energy — and perhaps three times as much — as an identical wind farm in Kansas, itself one of the windiest states in the U.S. A wind farm roughly twice the size of Alaska could generate 18 million megawatts of electricity. That’s enough to meet the entire global demand today. There are big practical challenges to building such a farm, including coping with extreme mid-ocean weather and transmitting the power back to shore. And by harvesting so much wind in the North Atlantic, a giant wind farm would reduce the output of onshore wind turbines in the U.K. and Western Europe — and reduce temperatures in the Arctic by more than 20 degrees. This might sound attractive at a time when polar ice is melting, but scientists worry about the unforeseen consequences of such geoengineering. These problems are still decades in the future; there are no immediate plans to build a giant mid-ocean wind farm. For now, the research has won praise from other experts in sustainable energy. The good news now is that smaller offshore wind farms are increasingly popular around the world. In the U.K., engineering firms now think they can build wind turbine capacity in the ocean for just over half the price of new nuclear power stations. Today’s offshore wind farms use turbines attached to the ocean floor; that limits their placement to shallow sites just off the coast. But floating turbines — able to tap the strong winds far out at sea — are coming soon. 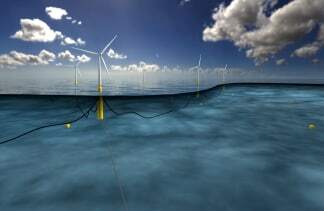 This month the world’s first floating wind farm (see illustration above) will begin operation in the deeps waters off Scotland, using technology originally developed for drilling platforms. When complete, it will provide power for around 20,000 homes.